RKA Consulting Group provided the professional engineering service pipeline design for this waterline project which involved the design of approximately 250 lineal feet of 30” ductile iron pipe crossing Euclid Avenue in the City of Chino, California. 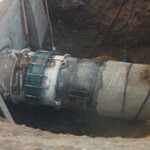 The project required the use of “jacking and boring” to not disturb the heavily traveled Euclid Avenue in the City of Chino. It also required coordination to connect existing lines.